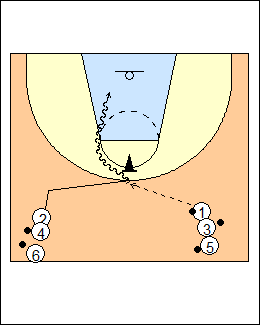 Two lines, 2 makes a change of direction move (v-cut), cuts to the top of the circle for a pass from 1, makes a crossover move and finishes with an outside-inside power layup or a jump shot. 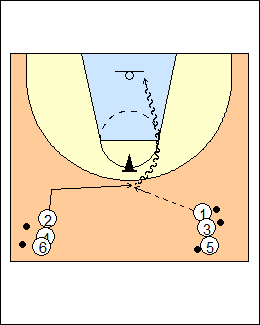 In a game, 2's defender is overplaying. 1 goes next, cutting on eye contact with 4. - other finishes, e.g. reverse layup, inside-hand, goofy-foot, one-hand pick-up, spin, pro hop, Euro step, floater. - back pivot, fake reverse pivot. 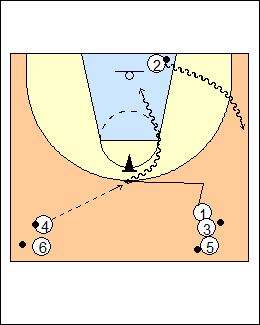 - practice cuts from the corner to the wing (blast cuts). See Layups - Kiwi cutting, Blast cuts, Shooting - Pasquali reaction, Tom Crean fill cuts, Dribbling - 5star triple b.